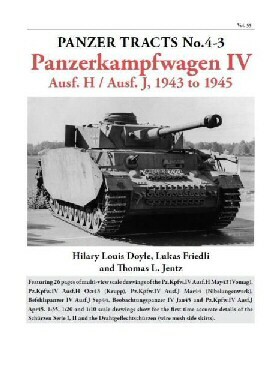 The Panzer Tracts Series,Tom Jentz,Hilary Louis Doyle,Lukas Friedli,World War Two German Armour. 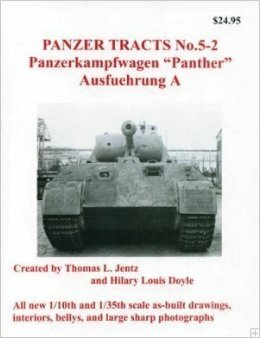 The Panzer Tracts monographs on World War II German armour are acknowledged to be the most comprehensive and accurate sources of information on the subject. 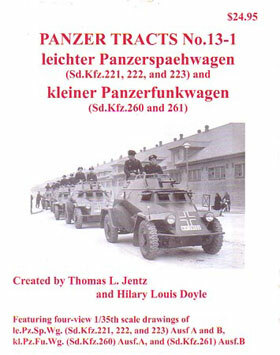 Enthusiasts, researchers and modellers value Panzer Tracts volumes as the prime source of extensively researched and accurate data on both well-known and more obscure armoured vehicles of the Third Reich era. As well as numerous photographs, they feature scale drawings which have been accurately measured from surviving examples of the vehicles preserved in museums worldwide. 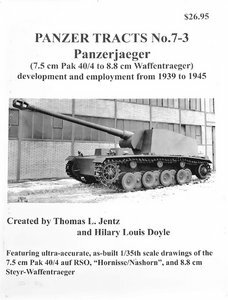 When no actual examples exist, the Panzer Tracts team have carried out extensive research over many years from original drawings and archives. Indeed. 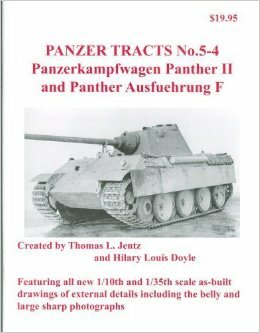 they have often unearthed information on previously unknown versions of specialised Panzers which were planned, never built, or produced in limited numbers. 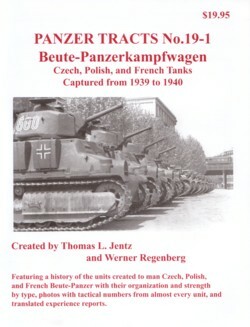 Sadly, Tom Jentz, the originator and guiding light of Panzer Tracts, passed away away in 2012. He is survived by his wife, Franziska who, together with long term collaborator and illustrator on the series, Hilary Louis Doyle, is continuing with the project. They will be assisted by Lukas Friedli who has already authored several other books on Panzers. The Military History Bookshop stocks all Panzer Tracts volumes which are currently in print and we obtain new titles as soon as they are released. 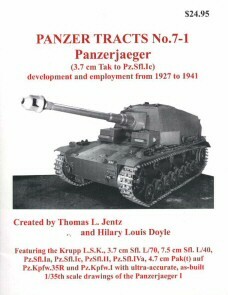 Visit our website regularly for latest details of available Panzer Tracts volumes. 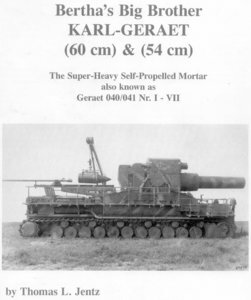 A splendid monograph on the German Super-Heavy, 54cm and 60cm Self-Propelled Mortar (also known as Geraet 040/041 Nr. I-VII). These incredible weapons were used on the Eastern Front but they were also employed at Budapest and in the Battle of the Bulge. From the US publisher of 'Panzer Tracts' the book has a wealth of photographic detail supported by knowledgable text invaluable to enthusiasts, modellers and historians. 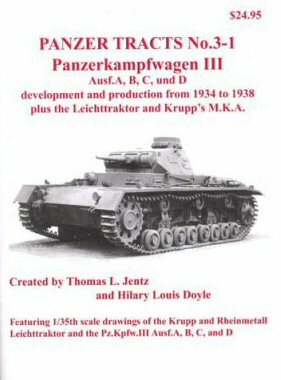 A splendid monograph on the Pz.Kpfw I from its early conception as the Kleintraktor, a small, fully tracked armored vehicle, to the Ausf.A and Ausf.B derivatives. With a wealth of photographic detail supported by knowledgeable text and splendid 1/24 scale General Arrangement and Detail drawings, this book will be invaluable to enthusiasts, modellers and historians alike. This second half of the history of the Pz.Kpfw I covers the kl.Pz.Bef.Wg Small Command Tank, the Schulfahrzeuge Driver Training Vehicles, the Krupp L.K.A & L.K.B. Light Tanks and the advanced designs for the Ausf.C (VK 6.01) and Ausf.F (VK 18.01) models. 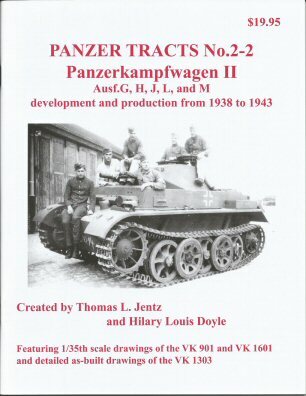 In the style we have come to expect from Panzer Tracts the monograph is complete with masses of photographic detail (including four color pages) plus knowledgeable text and splendid 1/24 scale General Arrangement and Detail drawings by Hilary Louis Doyle. Ausf.a/1 to C development and production from 1934 to 1940. For the first time the design evolution of the Pz.Kpfw.II is correctly tabulated and the characteristics of each Ausfuehrung (model) identified. Hundreds of hours were spent by the Pz Tracts team precisely measuring surviving Pz.Kpfw.II Ausf.c, A, B, and C components and over a thousand hours were spent in creating detailed. as-built drawings. This book is packed with new information on the history, production, unit organization, tactics and action reports from front-line units. All text and data are based solely on primary sources. Development and production from 1938 to 1943. An accurate history of the very rare variants from the Pz.Kpfw.II family - the VK 901, VK 903, VK 1301, VK 1303, and VK 1601. Original drawings, documented measurements, and original wartime photographs were used to create four-view drawings of the VK 901 and VK 1601 (printed at 1/35th scale). With as-built, six view drawings (including right side and belly) with both the VK 1301 and VK 1303 turrets in 1/24th scale, plus component drawings at 1/10th scale. 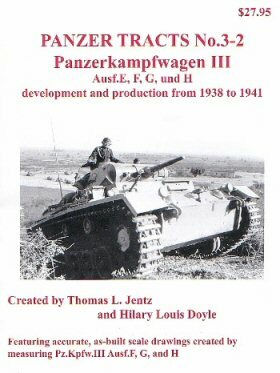 The Panzer Tracts team have compiled an accurate account of Germany's prewar development of the Pz.Kpfw.III Ausf.A to D and the predecessor Leichttraktor based on primary source documents created by those who designed, produced, and employed the Panzers. The real history of Krupp's MKA has also been included to dispel the erroneous belief that this export tank was a predecessor to the Pz.Kpfw.III. Component drawings from manuals have been precisely fitted together to create for the first time accurate four-view drawings of the Pz.Kpfw.III Ausf.D and side views of the Pz.Kpfw.III Ausf.A, B, and C. The book is packed with drawings and rare photos which correctly identify the external characteristics of each Ausfuehrung, including the five Pz.Kpfw.III Ausf.D with Ausf.B turrets. Development and production from 1938 to 1941. 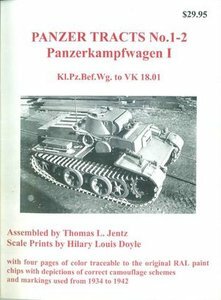 A history of the Panzerkampfwagen III variants used in the 1939 to 1941 campaigns. Survivors were accurately measured in detail and drawn at full scale to create as-built drawings. The authors use 1/10th scale drawings to illustrate the smallest details, with six-view (including right side and belly). 1/35th scale drawings illustrate the complete Pz.Kpfw.III. This new history includes 26 pages of 1:35, 1:20 and 1:10 scale CAD drawings of the Pz.Kpfw.IV Ausf.H May43 (Vomag), Pz.Kpfw.IV Ausf.H Oct43 (Krupp), Pz.Kpfw.IV Ausf.J Mar44 (NiWerk), Befehlspanzer IV Ausf.J Sep44, Beobachtungspanzer IV and Pz.Kpfw.IV Ausf.J. Emphasis has been placed on the features of each sub variant introduced by the three Assembly firms. Hundreds of hours were spent precisely measuring surviving Pz.Kpfw.IV and their components to create these new multi-view drawings. 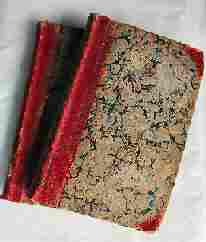 A surviving Drathgeflechtschuerzen was discovered and this revealed new details which are documented for the first time. Chassis number analysis has also led to an updated production history. As usual, data are based solely on primary sources and 90 large clear photos were chosen to illustrate the specific modifications. 67pp numerous b/w illustrationss and scale drawings. The Panzer Tracts team spent hundreds of hours precisely measuring survivors, and over a thousand hours drawing at full-scale to create drawings accurate to the tight tolerances of the original builders, and including many previously unrecorded modifications. 1/10th scale drawings illustrate the smallest details, while six-view, 1/35th scale drawings illustrate the complete Panther. Also features flat-plane drawings of many components to aid the modeling of hard to replicate parts. The ultimate reference for the Panther Ausf.G and its F.G.1250 infra-red scope and sight. 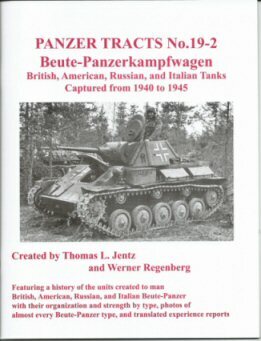 From the editors of Panzer Tracts this is a detailed history of the creation, production, and combat of these famous tank destroyers from 1927 to 1941. This first volume covers the initial attempts to create a chassis specifically designed for self-propelled anti-tank guns (which didn't get into mass production) and the resulting makeshift conversions on available armored chassis. Altogether 12 different projects are covered starting with the real Zwischenloesung, Krupp L.S.K., L.Tr.Sfl, 3.7 cm and 7.5 cm Sfl, Pz.Sfl.II, 8.8 cm Flak 18 Sfl, Pz.Sfl.IVa, Pz.Jaeg.I, 4.7 cm Pak(t) auf Pz.Kpfw.35R, and ending with the rare trial Pz.Sfl.Ia and Pz.Sfl.Ic. From the editors of Panzer Tracts this is a detailed history of the creation, production, and combat of these famous tank destroyers. 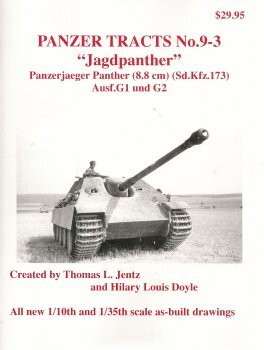 This third volume is the result of a 37-year search for original records of these Panzerjaeger. The authors have uncovered the facts on their names (and correct nicknames), production, modifications, issue, organization, and frontline employment. The book features new, accurate,1/35th scale drawings of the 7.5 cm Pak 40/4 auf RSO, Panzerjaeger Hornisse/Nashorn, and 8.8 cm Steyr-Waffentraeger. 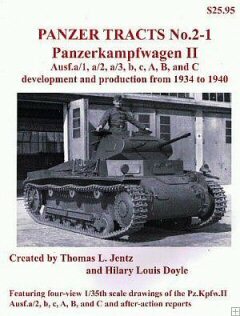 This new volume includes rare photos taken during production of the Sturmpanzer Ausf.I, Ausf.II, Ausf.III and Ausf.IV. assault tank at the Wien Arsenal in Austria and the production line at Duisburg. Additionally, there are illustrations covering field use of every version of the Sturmpanzer in Russia, Italy, France and Eastern Europe plus clear photos of the Munitionspanzer, built to accompany the Sturmpanzer into combat. 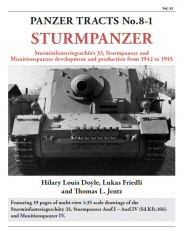 With 19 pages of 1:35 scale drawings, plus more than 80 large-format photos, this is the ultimate package of primary source material on the Sturmpanzer. 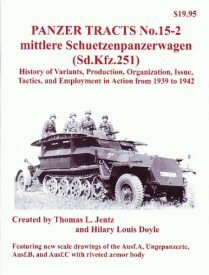 This is one of the last Panzer Tracts volumes co-authored by Tom Jentz who sadly passed away in December, 2012. Development and production from 1943 to 1945. The Panzer Tracts team have produced new drawings for three different Jagdpanzer IV, two different Panzer IV/70 (V), and one Panzer IV/70 (A) and the dates of significant modifications have been correctly determined. Precise measurement of the external features of seven survivors revealed that the superstructure roof of the Panzer IV/70 (V) is 30 mm shorter than the Jagdpanzer IV (and the roof of the Panzer IV/70 (A) shorter still). Three pages of 1/10 Scale drawings of special components, tools and holders are included. Text and data are based solely on primary sources. PANZER TRACTS NO. 9-3: "JAGDPANTHER"
The Panzer Tracts team spent hundreds of hours accurately measuring surviving examples of the Panzerjaeger Panther (Sd.Kfz.173) Ausf.G1 and G2 to create drawings accurate to the tight tolerances demanded of the original assembly firms. This new volume includes 1/10th scale drawings to illustrate the smallest details, while six-view, 1/35th scale drawings show the complete Jagdpanther. There are also scrap drawings of many components to aid modelers . The book is packed with information on the development history, production, unit organization, issue, tactics, and front-line unit reports. 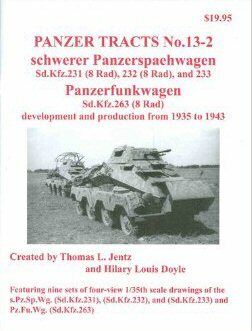 This latest Panzer Tracts volume features Sd.Kfz.221, 222, 223 and Sd.Kfz.260 and 161 development and production from 1935 to 1944. The defining features of each sub variant have been identified and significant modifications listed. This has been made possible by over 40 years of research in private and public archives and chassis number analysis. Surviving LE.Pz.Sp.Wg. and KL.Pz.Fu.Wg. components were precisely measured to create new five-view 1/35 scale drawings. As usual, text and data are based solely on primary sources. As at January, 2016 there are very few copies of this title available as it is now officially out of print. For the first time the design evolution of the le.S.P.W. (Sd.Kfz.250) has been correctly recorded from primary sources, starting with the 0-Serie, then the Ausf.A with Panzeraufbau Sd.Kfz.250/Z and Sd.Kfz. 250E, and finally the Ausf.B with both riveted and welded Panzerwanne. Hundreds of hours were spent precisely measuring and drawing surviving le.S.P.W. (Sd.Kfz.250). The four different Grundfahrzeuge as well as the Sd.Kfz.250/1, 250/3, 250/5, 250/8, 250/9, and 250/10 are ilustrated. Some components and weapons have been included to reveal details normally hidden in four-view drawings and photographs. This book is packed with new information on the history, production, unit organization and tactics, plus wartime reports from front-line units. History of Variants, Production, Organization, Issue, Tactics, and Employment in Action from 1939 to 1942. The Panzer Tracts team measured a surviving Ausf.C with a riveted armor body in order to create detailed as-built drawings. 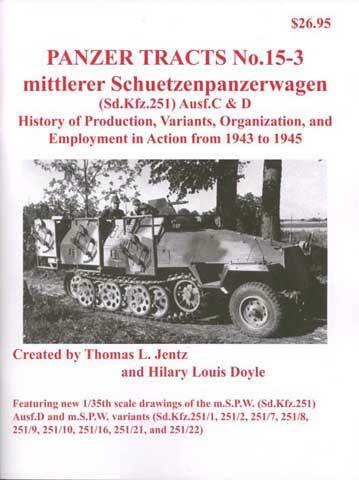 This in depth research also allowed the creation of accurate drawings of the related Ausf.A and the often misidentified mittlere ungepanzerte Mannschafts -transportwagen (Sd.Kfz.251). This book is packed with new information on the history, production, unit organization, issue, tactics, and wartime reports from front-line units. History of Production, Variants, Organization, and Employment in Action from 1943 to 1945. Thousands of hours were spent precisely measuring surviving Sd.Kfz.251 Ausf.D and associated components, and creating detailed drawings of the Sd.Kfz.251/1, 251/2, 251/7-10, 251/16, 251/21, and 251/22. In order to reveal details normally hidden in four-view drawings and photographs, new drawings of the weapons (s.M.G., 8 cm Gr.W., 3.7 cm Pak, 7.5 cm K.37, 7.5 cm K.51, and 1.5 cm and 2 cm Drilling) and other equipment are printed in 1/20th scale on separate pages. The book is packed with new information on the history, production, unit organization, tactics, and wartime reports from front-line units. This new history includes 16 pages of 1:35, 1:20 and 1:10 scale CAD drawings of the HKp 6.03, Munition-und Mannschaftsträger am Fahrgestell 38 M, Katzchen K1, Katzchen K2, Katzchen 38t, Auto-Union Aufklarer, m.S.P.W. (2cm)(Sd.Kfz.251/17), m.S.P.W. (2cm)(Sd.Kfz.251/17) Ausf.B Schwebelafette, m.S.P.W. (Uhu) (Sd.Kfz.251/20), Artillerie Beobachtungs Wagen (Sd.Kfz.251) and m.S.P.W. (7,5cm)(Sd.Kfz.251) AK7B84. 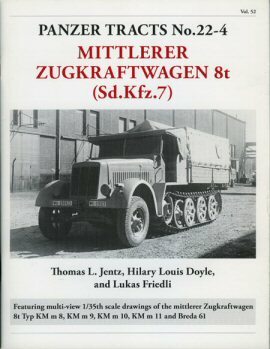 The first part of the book covers the ongoing development of the semi-track mittlerer Schützenpanzerwagen with the objective of turning it in to a suitable combat vehicle.By November 1941 a specification was issued for a fully tracked M.S.P. (Mittlerer Schützen Panzerwagen) to replace the Sd.Kfz.251 and designated “Katzchen” (meaning Kitten). The result was a highly effective fully-tracked carrier. Parallel with this, the war situation demanded solutions based on the readily available Sd.Kfz.251. 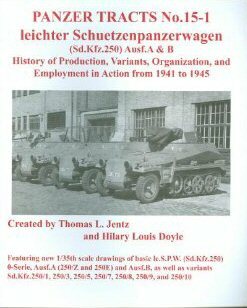 Research has led to the acquisition of new information that was not available when Panzer Tracts No.15-3 was published, leading to large scale accurate drawing of the 2cm Schwebelafette 38 for the Sd.Kfz.251/17 and other final Sd.Kfz.251 projects. As usual the data are based solely on primary sources. 60 large photos illustrate this exciting book. The history of the Bergepanther was difficult to unravel: there was a lack of clarity in the original German documentation, and the Allies were only interested in Bergepanther equipped with the 40t winch and associated spade. 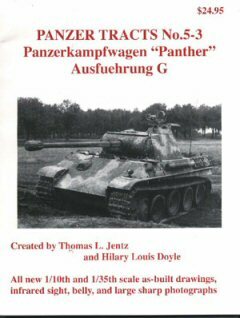 Now, Panzer Tracts reveals a more comprehensive account of the Bergepanther which was essential to the functioning of Panther and Tiger units. Besides the Ausf.A and G, there were three different versions converted from the turretless Pz.Kpfw.Panther chassis. Two were new vehicles while the final one was rebuilt from large numbers of Panther Ausf.D. Packed with accurate, as-built 1:35 scale drawings, this new work is the ultimate reference on the Bergepanther. For the first time the Panzer Tracts team have compiled an accurate record of the features of each Pz.Kpfw.38(t) Ausfuehrung. More than one thousand hours of study of surviving vehicles enabled them to create accurate four-view drawings of the Ausf.B, C, D, E, F and S, plus six-view drawings of the Ausf.A and G. This new edition is illustrated with fifty drawings, plus sixty seven rare photographs correctly identifying the external characteristics of each variant. Czech, Polish and French Tanks captured from 1939 to 1940. 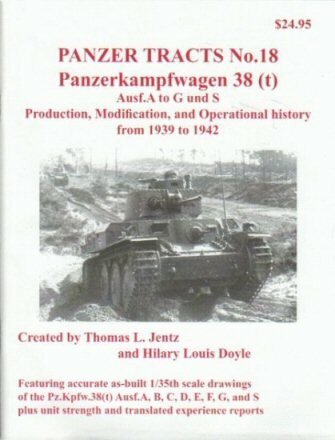 This new Panzer Tracts volume is packed with information on the history, organisational structure, unit strength, tactics and types of Beute-Panzer issued to each unit. Werner Regenberg has compiled a massive archive of original documents and photographs, complete with unique unit markings. British, American, Russian and Italian Tanks captured from 1940 to 1945. 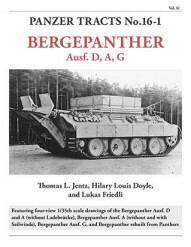 Thanks to the efforts of Werner Regenberg in concentrating his 30 year research career on Beute-Panzer used by the German army in WWII, this book is packed with new information on the history, organizational structure, unit strength, tactics, and types of Beute-Panzer issued to each unit. Numerous photos with unique unit markings have been included for representative units with captions that correctly identify the Beute-Panzer units. Development and production from 1935 to 1945. A detailed study on the design evolution of the le.Zgkw. 1 t (Sd.Kfz.10). The book covers three Liliput models then two different D 6 models, and finally the Ausf.A and B of the D 7. 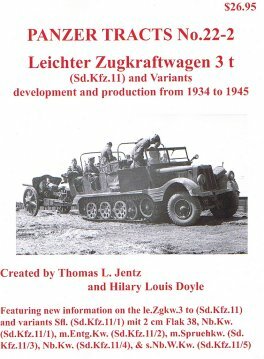 From precise measurements of surviving le.Zgkw.1 t (Sd.Kfz.10) and associated components, the authors created detailed drawings of the basic le.Zgkw.1 t (Sd.Kfz.10) produced in 1939, 1940, and 1942 as well as the associated variants Gasspuererkw. (Sd.Kfz.10/1), le.Entgiftungskw. (Sd.Kfz.10/2), Sfl. (Sd.Kfz.10/4) fuer 2 cm Flak 30 produced in 1939 and 1940, and Sfl. (Sd.Kfz.10/5) fuer 2 cm Flak 38 produced in 1942 and 1944. Development and production from 1934 to 1945. The design evolution of the le.Zgkw. 3 t (Sd.Kfz.11. Hundreds of hours were spent precisely measuring surviving le.Zgkw.3 t (Sd.Kfz.11) and associated components resulting in detailed drawings of the basic le.Zgkw.3 t (Sd.Kfz.11) as well as the associated variant. The book is packed with new information on the history, development, production, unit organization, and wartime reports. In accordance with Panzer Tracts high standards, the text and data are based solely on primary sources. The m.Zgkw.8t was one of the most important German military vehicles, due to impressive size and the weapons they towed. Many m.Zgkw.8t have survived in public and private collections, including examples of all the chassis types and Several hundred hours were spent precisely measuring each, and over one thousand hours were expended to create accurate drawings. Panzer Tracts primary research also yielded numerous previously undocumented modifications, including the history of the Trattore Semicingolato 8t which Breda was licensed to build for the Italian army. Packed with accurate, as-built 1:35 scale drawings and photographs, this new work is the ultimate reference on the m.Zgkw.8t. This new volume features peviously unknown facts about the armoured 8t built together with the 8,8cm Flak 18 bunker buster "Bunkerknacker". Until now Sfl. auf m.Zgkw. 8t half-tracked, self-propelled guns have simply been identified by weapon: eg. 2cm Flakvierling (Sd.Kfz.7/1) or 3,7cm Flak (Sd.Kfz.7/2). 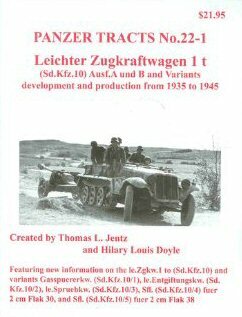 Now Panzer Tracts sets the record straight with descriptions of no less than 12 different Sfl.Flak variants. Also featured is the enlarged 8t Zgkw. (Sd.Kfz.7/6) created to carry the range finding equipment of the 8.8cm Flak Batterie, the Feuerleitpanzer, armoured control centre for launching A4 (V2) rockets, and the surprisingly widespread "Behelfspanzerung" which will be new to most enthusiasts. Several Selbstfahrlafette auf m.Zgkw. 8t and all of the Flak guns have survived to the present day, enabling the team to create accurate drawings of each type. 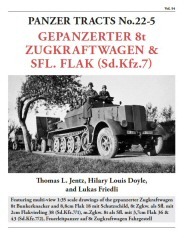 21 pages of 1:35 scale drawings and over 100 clear large-format photos make this the ultimate reference on the gepanzerter Zugkraftwagen 8t (Sd.Kfz.7) and Flak Sfl. 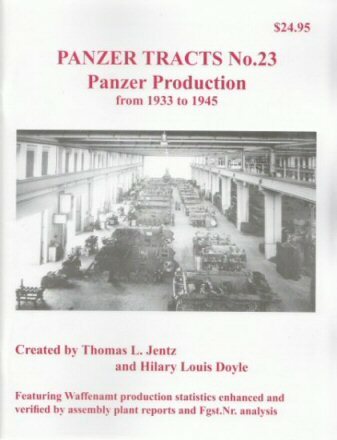 This is one of the last Panzer Tracts volumes co-authored by Tom Jentz who sadly passed away in December, 2012. 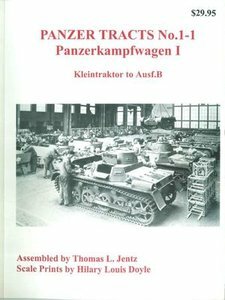 After forty years of research, The Panzer Tracts team have compiled a record of how many Panzers by model were produced by each assembly plant. Starting in February 1939, the Waffenamt kept consolidated records of monthly production but these are of limited value when more than one assembly plant was involved. The additional details needed to determine the number produced for each model were derived from assembly plant production records, analysis of chassis numbers and the code letters for each assembly plant which were stamped on serial number plates. As usual text and data are based solely on primary sources.